3D printing is one of the coolest inventions we've seen in our lifetime, and now you can join the ranks of businesspeople, entrepreneurs, and hobbyists who use it to do everything from printing foods and candles to replacement parts for older technologies-and tons of mind-blowing stuff in between! 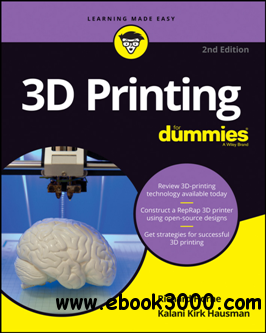 With 3D Printing For Dummies at the helm, you'll find all the fast and easy-to-follow guidance you need to grasp the methods available to create 3D printable objects using software, 3D scanners, and even photographs through open source software applications like 123D Catch. Thanks to the growing availability of 3D printers, this remarkable technology is coming to the masses, and there's no time like the present to let your imagination run wild and actually create whatever you dream up-quickly and inexpensively. When it comes to 3D printing, the sky's the limit!